It’s one of the many quirks associated with growing older – your memory becomes a little less reliable. Fortunately, scientists have worked for years trying to figure out how and why we start forgetting things with age, and many tech businesses have jumped on the results and released apps and tools to help you stop being so absent-minded. Thankfully all of this research and work have resulted in plenty of choices when it comes to brain training exercises online, and the following 12 apps and tools include some of the best options to make sure you remain alert and aware. This is a great tool for anyone who likes to receive updates through their smartphone. 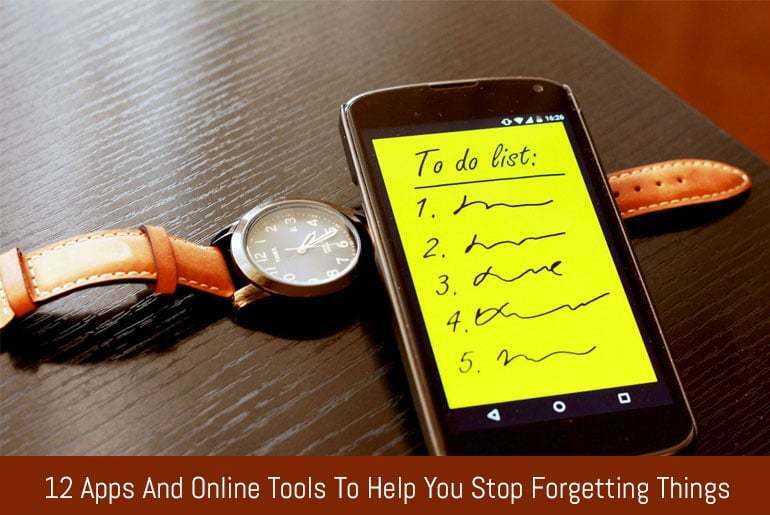 With this app, instead of trying to remember everything you have to do, or writing a list that can be easily lost, you can simply write down your tasks on your phone, alongside when they need to be done. You’ll then receive a text, email or other forms of notification to remind you of what you need to do. What’s great is that you can also set repeat reminders. It’s been acknowledged for years that writing is a great exercise for your brain. Being creative and finding an outlet for your emotions is also great for a whole variety of mental health issues, so the fact that it can help you remember things too is just an added bonus. If you’re not sure where to start when it comes to writing, then the support forums available here can be really helpful. One of the biggest problems with making to-do lists is that once you put that list down, it can seem lost forever. That’s no longer a problem with Evernote, as when you write something down on one device, it is then available on everything. This means you can make a note on your computer then check it on your phone while you’re out and about. If you always see interesting articles or recipes online and then can never find them later, then this could be a great app for you. This app allows you to save documents you find online so you can easily access them later, and it also allows you to make notes which you can highlight, so you can make sure anything important jumps out at you. This is a great tool for anyone wanting to explore different kinds of writing, which we all know is great for improving your memory. This writing tool can provide help and support so you can write well and take pride in what you’re doing to help your memory. Sometimes, we need a break. And while we can’t forget anything important, we can write it all down, have a day off, and do it tomorrow. Remembering the passwords we have for various websites isn’t easy, and this is a safe and secure space to store them and make sure you don’t get locked out of your own accounts. This is a great source for anyone looking for a writing tool. Writing is so good for keeping the memory parts of your brain alive and active, and this is an amazing resource to help hit your writing goals. Sometimes we don’t need to be reminded of something as it’s happening, like a birthday party or an event, we need to be prepared, and having this app count us down to events means we can prepare outfits, gifts, cards, and never be caught short again. Sometimes you need to remember something specific to a friend or family member – this allows you to connect a note to their contact, and it appears as they call, so you can read your note and not forget anything while on the phone. It’s great to know that it’s healthy to start writing; however it can be difficult to know where to start. This writing tool can make the process easier. This is a great app for to do lists, but the stand out feature is that the lists can be shared, so family or household tasks can be seen and shared by everyone. Using any combination of the above tools can make remembering thing as you get older a whole lot easier. Gloria Kopp is a content marketing strategist and a social media manager at Academized. She enjoys sharing her writing advice in her posts at Engadget, The Tab and the Australian Help blog. Gloria also writes for Studydemic blog where she shares her tips and reviews for students and educators.